Of the 85,000 Refugees entering the US in 2016, 61% were Christian. Thousands of refugees fleeing from African and Middle Eastern countries end up in the United States and Europe. The U.S. has seen refugee arrivals for a long time. The common factor tying all refugees across different time periods are people running away from conflicts in their home countries for the quest of a better life. Data extracted from the Refugee Processing Center managed by the U.S. State Department shows over 3 million refugees have stepped foot on American soil since 1975. The Pew Research Center found out approximately one third of all refugees granted admittance into the U.S. during the 2016 fiscal year were themselves religious minorities. Among the refugees admitted into the U.S., Christians make up 61 percent. Muslims make up 22 percent, the second biggest group of refugees by religion. At the end of the spectrum are Hindus and other minority religions. These facts have special significance as the present U.S. administration under President Donald J. Trump have made the announcement that religious minorities will be offered refugee status in the United States. President Trump himself has overtly said that Christians will be favored over others. 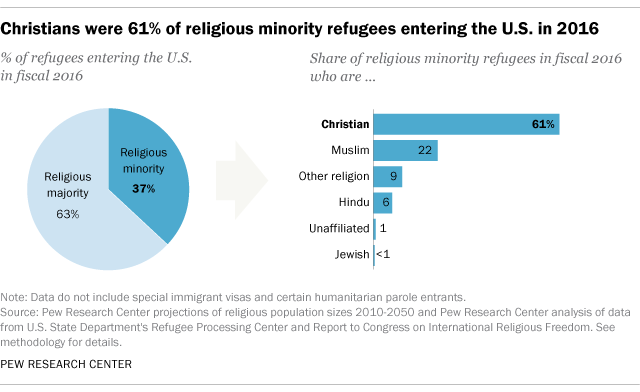 The figures related to refugee arrival, however, gets skewed when two-thirds of all refugees entering into the U.S. are regarded as religious majorities in the fiscal year 2016. 60 percent of such refugees were found to be Muslim. Christians and Buddhists make up about six percent of total refugees. Most of them are of Bhutanese and Burmese origin. When it came to the nationality break up of refugees entering the United States in 2016. 10 countries contributed the maximum of a total of 85,000 individuals. The Democratic Republic of Congo contributed 19 percent- the biggest tap of refugees. This African country was followed by Syria and Burma at 15 percent. Iraq and Somalia contributed 12 percent and 11 percent respectively. Bhutan and Iran make up the next two, at seven percent and four percent of total refugees respectively. Three percent of total refugees are Afghans. It should be noted that Christians form a majority population in only three of the many refugee producing countries. The largest refugee contributor- Democratic Republic of Congo- to the U.S. is majorly Christian. The Christian denomination is spread evenly among Protestant and Roman Catholic Christians. 61 percent of the total refugees entering the United States in 2016 from Eritrea were classified as Orthodox Christians. Why are Muslim Immigrants Converting to Christianity?